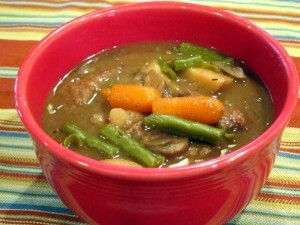 I like a hearty brown stew when the weather turns cool. That used to mean pot roasts and beef stews but these days I enjoy lighter fare. The secret to this dish is letting roasted veggies and herbs cook down into a thick gravy, then add fresh chopped veggies the last 10 minutes — I like cooked veggies to have a light crunch. Earlier I’d roasted some veggies, so I added a cup each of roasted carrots and celery and onions to a 2 quart saucepan, then added two 1-quart cartons of low sodium chicken broth. I chopped 2 large russet potatoes very finely diced, and 16 oz of white mushrooms. I added a teaspoon each of turmeric, salt, pepper, garlic powder, dried basil, dried tarragon, crushed fennel seeds, paprika and 1 tbsp fresh chopped rosemary and chili powder. I added 2 dried bay leaves, left the pot slightly uncovered and brought it to a simmer for 40 minutes. I used a hand mixer to puree the soup down to a smooth consistency. The potatoes melt into the broth making a thick gravy. Check for seasoning, add salt and pepper as needed. Then I add another half cup of chopped carrots, a cup of chopped green beans and a handful each of mushrooms and kale and cook another 10 minutes until carrots and green beans are almost cooked but have a slight crunch to them. This cooks into a very thick, flavorful and hearty meatless dish. This entry was posted in Uncategorized on March 14, 2016 by goddess.